Read online "... 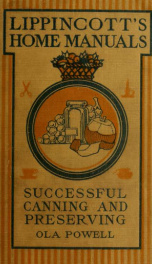 Successful canning and preserving ; practical hand book for schools, clubs, and home use, by Ola Powell ... Pen and ink sketches by Rose E. Gamble. 5 colored plates, 174 illustrations in text" by Powell, Ola, b. 1889. Instant free e-book download at OnRead.com.